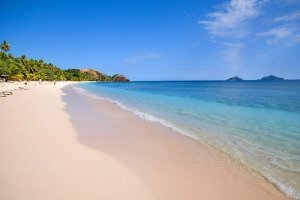 Malolo Island is ideally situated in the heart of the Mamanuca Group of Islands in Fiji. It was created by a volcano millions of years ago and as such features high mountains in the centre of the island and coastal areas that are fringed with white, sandy beaches. The island relies on tourism and has a number of resorts that provide all sorts of accommodation. Malolo Island has some truly amazing scenery with its long stretches of beach, tall palm trees and tropical rainforests. On Malolo Island you will find lots of different activities that you can enjoy including snorkeling, fishing, boating, wind surfing, swimming and sight-seeing. In fact there is so much to see and do that you will find that Malolo Island is perfect for families and couples. Located in the midst of the Mamanuca Islands approximately 25 kms west of Fiji's Nadi Airport is Malolo Island. Guests travelling to Malolo Island can either do so by Pacific Island Seaplanes which leave from Nadi airport and take about 10 minutes, a 30 minute boat ride via speed boat from Denarau Marina or a 1 hour direct (or 2 hour indirect) cruise from South Sea Cruises which also leaves from Denarau Marina. You can click here to see all Malolo Island Rates & Availability. The Tropica Island Resort is perfectly located on Malolo Island just a few steps away from the beach. It provides couples and families with luxurious accommodation in a secluded spot. Guests at the Malolo Island resort can enjoy the sun on the long stretch of golden beach, walk through the lush tropical gardens or party the night away with other fun loving guests. The Walu Beach features a pristine blue lagoon on its main beach, allowing guests to swim in the warm clear crystal waters of the Pacific. Alternatively you can relax in the resort swimming pool. Once you stay at the amazing Malolo Island resort in Fiji you will be coming back again and again. The Plantation Island Resort has 7 kms of sandy beachfront that is surrounded by azure waters and amazing coral reefs. This tropical paradise is ideally positioned on the edge of a blue lagoon on the Malolo Lailai Island. The Plantation Island Resort is situatedin the famous Mamanuca Group of islands making it the perfect holiday destination for families and couples. It consists of friendly staff, a wide range of dining options including 3 bars and 3 restaurants, fabulous facilities including 3 unique swimming pools & a water slide for the kids, many great adventure activities and a range of accommodation styles to suit all budgets. The Lomani Island Resort is a totally unique place to stay offering a romantic atmosphere and total relaxation for those people who are looking for a boutique retreat away from their hectic lifestyle. Ideally positioned in the beautiful Mamanuca group of Islands the Lomani Island Resort is surrounded by beautiful flower gardens and the turquoise waters of the lagoon. Access to this resort accommodation is via the Malolo Catermaran and whilst you are staying at this Malolo resort you can experience snorkelling, canoeing, sailing, relaxing massage or even a guided culture village tour. If you want hotel and/or resort accommodation on Malolo Island at cheap rates for your next holiday then Holidays Fiji is the place for you. We give holiday travellers the ability to compare a range of hotels, resorts and apartments at the same time, thus making it easier for you to decide where it is that you want to stay. So book your accommodation at any of the Malolo Island resorts with confidence, and even take advantage of the cheaper rates for longer stays.